Having faith doesn't always mean worshipping a deity. From the far-flung corners of Golarion to the centre of its major cities, many adherents find faith in small congregations dedicated to obscure beliefs and complex philosophies. 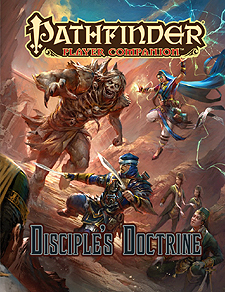 Pathfinder Player Companion: Disciple's Doctrine explores a dozen of these cults and traditions, including such groups as the Esoteric Order of the Palatine Eye, Magnimar's mystery cults, the Oracular Council of Po Li in Tian Xia, the Prophets of Kalistrade, and many more. Learn more about these lesser-known groups, and discover the class and character options that true faith and deep traditions can unlock. A host of character traits for those with a background in devotion or dogma, including the natural ritualist faith trait for those who venerate the outdoors and the ecumenical social trait for those who grew up learning about many deities. Archetypes for adherents of these doctrines, from the fist of the Godclaw warpriest for members of that Hellknight order to the seeker of enlightenment spiritualist dedicated to learning about Sangpotshi, the River of Life. A wide array of spells for the faithful and those who have learned from them, including protective spells tied to the Kalistocrats of Druma and prophetic spells connected to the Harbingers of Fate. This Pathfinder Player Companion is intended for use with the Pathfinder Roleplaying Game and the Pathfinder campaign setting, but it can be easily incorporated into any fantasy world.